Many teens need orthodontic treatment, but that does not mean that all of them appreciate or enjoy the treatment process. Invisalign Teen allows your teen to complete orthodontic treatment without the need for wires and brackets, which can interfere with busy social lives and extracurricular activities. Our Burbank Invisalign Teen expert can help you determine if Invisalign is a good fit for your teen. Invisalign Teen uses a series of clear plastic aligners, which are custom fitted for each user. Our expert in Invisalign Teen in Burbank begins with a complete dental exam. Treatment is planned carefully using computer images and records that allow us to recreate your teen’s smile. Each new aligner will move the teeth a little more until the desired results have been achieved. While Invisalign Teen was developed based on the same principles that are used in the FDA-approved Invisalign treatment for adults, it offers some unique features that make them easier and more appropriate for teens. Special tabs allow the aligners to better accommodate erupting molars, and colored indicators let teens know when it is time to move on to their next aligner. 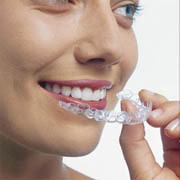 Many teens appreciate not just the comfort but also the privacy that Invisalign Teen can offer. They can feel self-confident throughout orthodontic treatment, and they can continue participating in their favorite athletic events, band and other extracurricular activities. Because they have more control over their treatment, they will need fewer visits with our Burbank Invisalign Teen expert, which means fewer interruptions to their busy schedules. Your teen may be a candidate for Invisalign Teen if he or she has crowded teeth, widely spaced teeth or an overbite, crossbite or underbite. Treatment requires about a year for most teens, but it can take more or less time based on your teen’s individual needs. Aligners should be worn at least 20 hours a day and only removed for dental hygiene, eating or playing sports, and they should be changed according to recommendations. Good dental hygiene is essential to any orthodontic treatment plan. Contact our office today to learn if Invisalign Teen is right for your teen or to schedule a consultation with our expert in Invisalign Teen in Burbank.